The Hoover kicking incident on Saturday morning left me with a very painful foot. It throbbed all day at work. When I got home and took my shoe off, my foot was swollen and there was an alarming crunching sound when I walked/limped. The ache felt very familiar, reminiscent of my broken metatarsal. The suspicion that I might actually have broken my little toe began to dawn. This was not good! A bit of late night Googling told me there isn’t much the medical profession can do about broken phalanges, especially little ones. All they’d do if it was broken was strap it up. As a trip to A&E would just mean hours of waiting for an X-ray and a bandage I decided not to bother. Broken or not, rest and a bandage would fix it sooner or later. For a millisecond I thought about staying at home with my foot up on Sunday but I’m rubbish at sitting doing nothing so I came to a compromise. 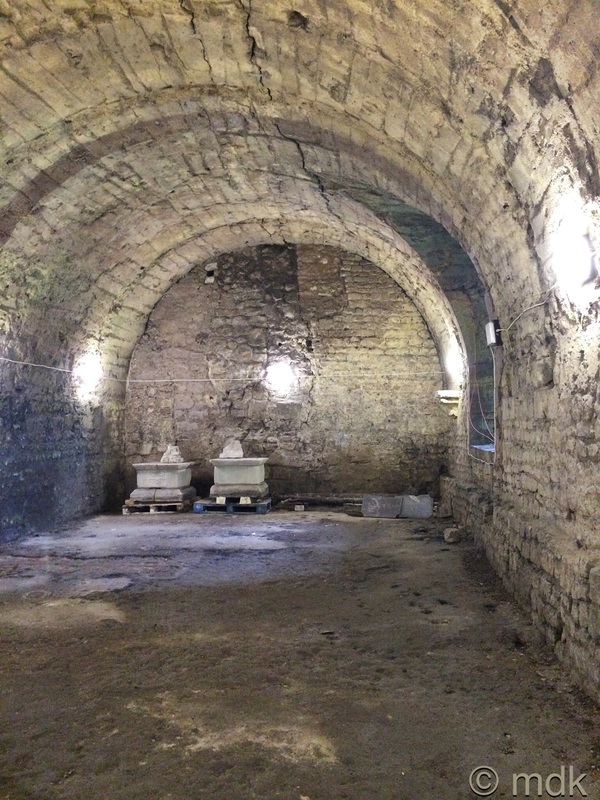 If I got a bus to town I could take the Southampton vaults tour. How much walking could there be? CJ caught me as I was getting ready and, when he found out what I was up to, decided he’d come along to look after me. That was his excuse anyway, but I know he’s always wanted to see the vaults. Typically, it was a beautiful, blue sky day, more suitable for a walk by the river than a dark cellar but it was better than sitting at home. 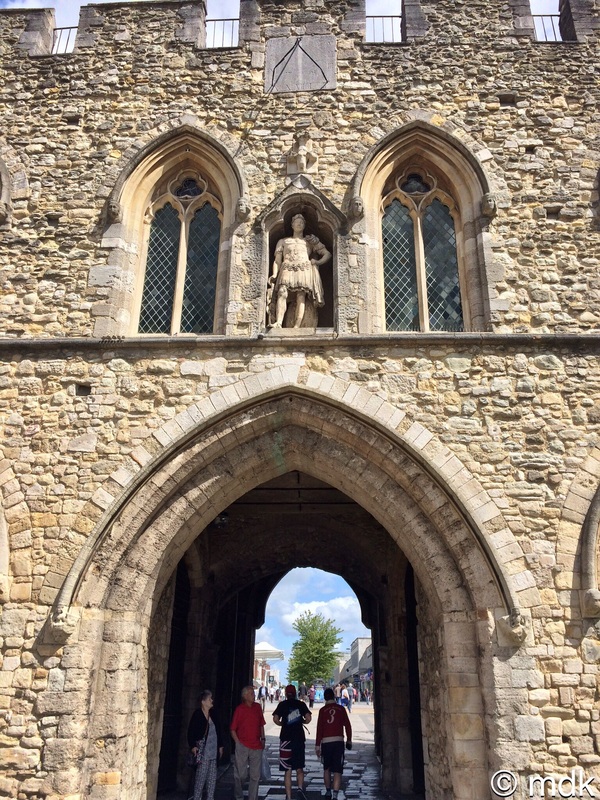 We got to the Bargate with about ten minutes to spare. Through the arch in the old walled town we found a woman with a clipboard, a father with his young son and a couple who looked to be in their early forties. We paid our money and, at the last minute, two young men from London joined us. 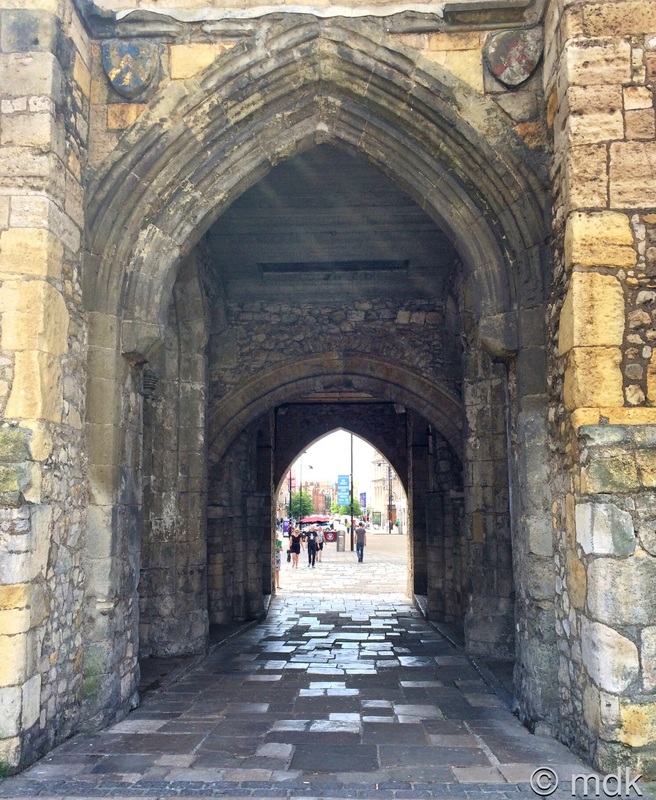 The tour of the vaults also included a walk of part of the old walls, beginning with a little of the history of the Bargate. As our tour guide, Diana, asked questions, it became clear that the majority of the group knew very little and I realised I’d best keep my mouth shut unless I wanted to be singled out as a know it all swot. Maybe I should apply for a job as a tour guide, then I could spend all day walking round the city showing off. After a historical snapshot of the Bargate, we followed the line of the walls to the slender bridge and onwards to Arundel Tower. So far my toe was holding up, more or less. 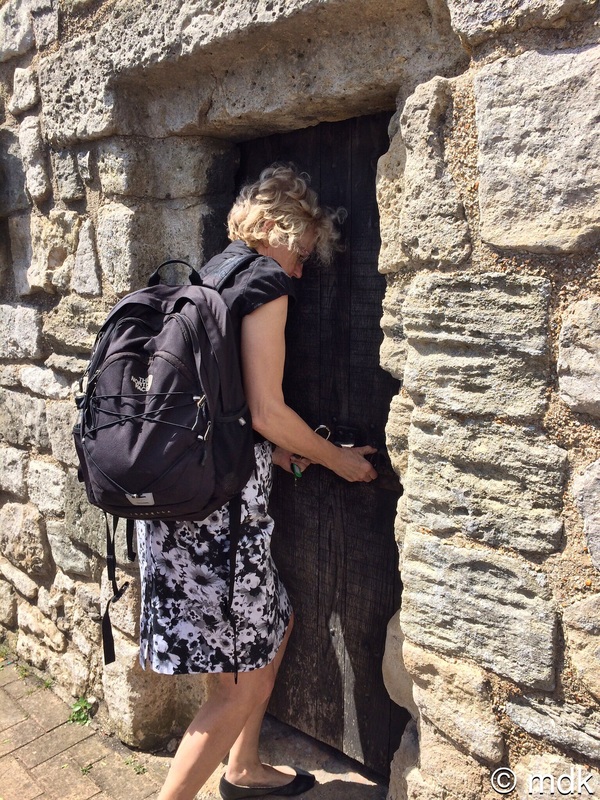 When we got to Catchcold Tower I expected another climb but we stopped outside the mysterious wooden door. How many times have I wondered what was behind that door? When Diana produced a bunch of keys I was almost beside myself. After a little fiddling with the padlock the door swung open and we all piled inside into the darkness. 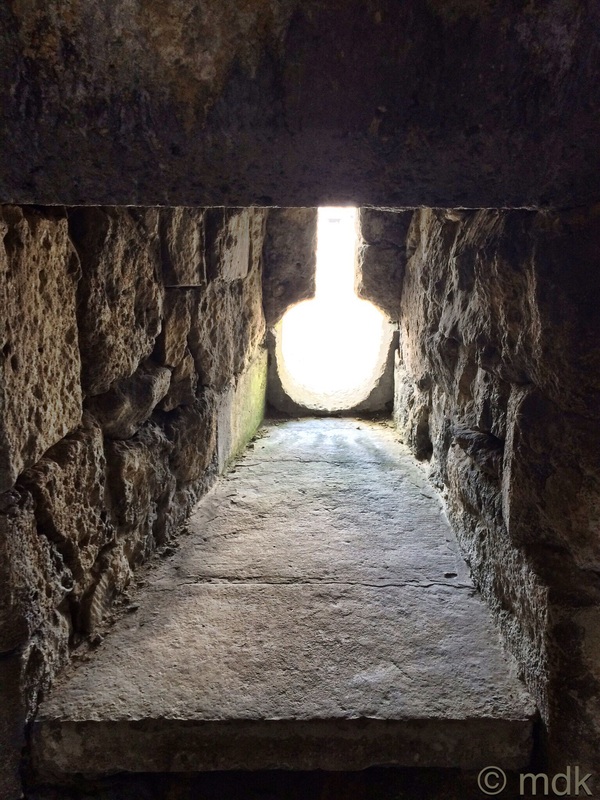 What I’d expected to see was a staircase to the bottom of the tower, or maybe a secret passageway. 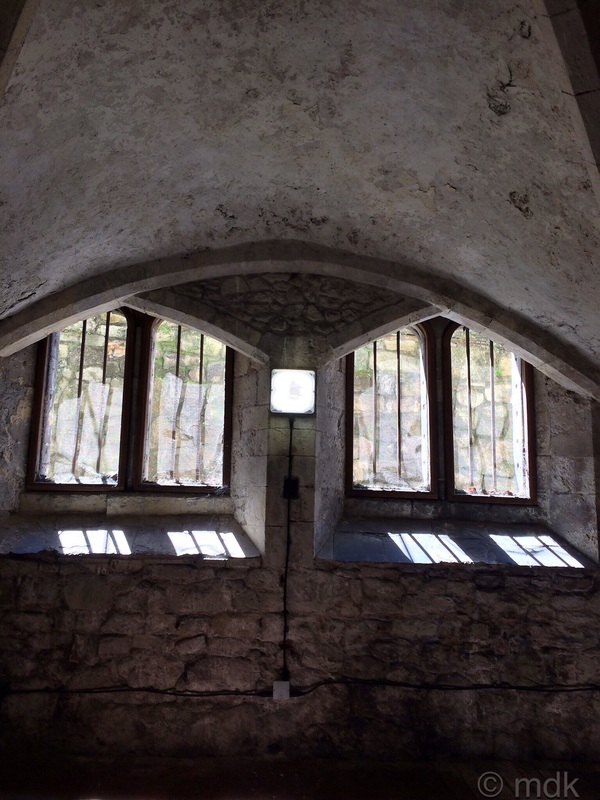 As our eyes adjusted to the dim light I was surprised to find we were in a small round room with a low, slightly domed ceiling and three tiny, odd shaped windows. 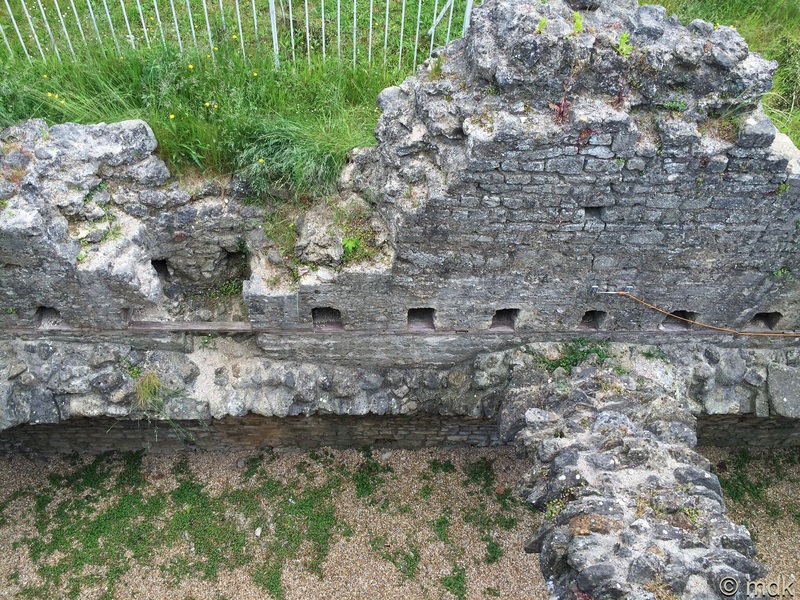 The tower was built in the fifteenth century, one of the newest parts of the walls, and I knew it was also one of the earliest gun towers in the country. What I didn’t know was that the guns, or cannon, were hidden inside the tower and not, as I’d thought, fired from the top. We were in the gun room. 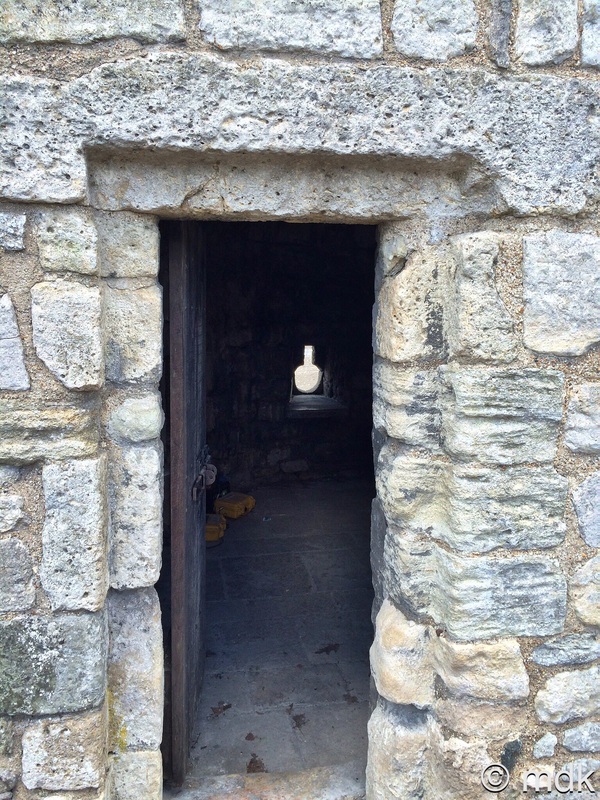 What I’d taken for windows were in fact keyhole gunports looking out over what was once sea. There would have been one small cannon that could be moved around to fire in whichever direction the threat was. 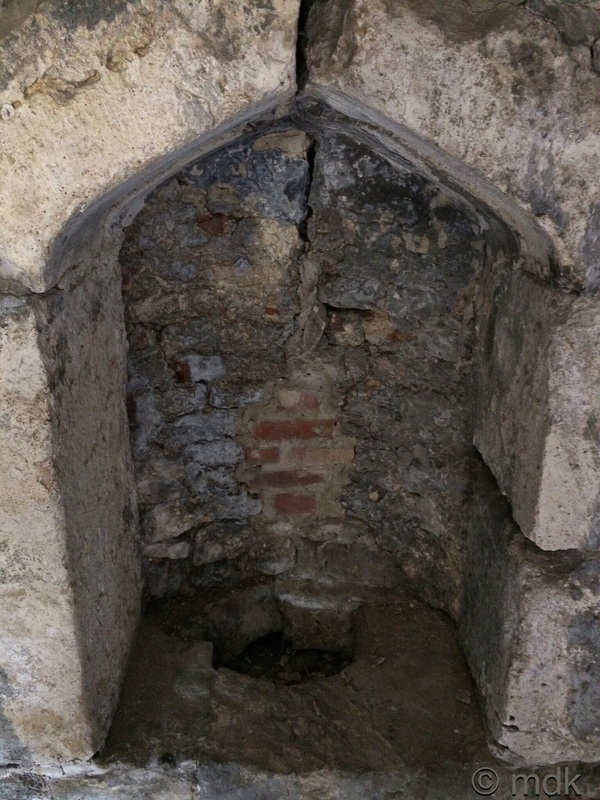 No one is sure exactly what the small alcove with a basin like structure was for but it probably contained water. The tiny chamber must have become unbearably hot and smoky if a cannon was fired so maybe the gunners used it to cool themselves off. 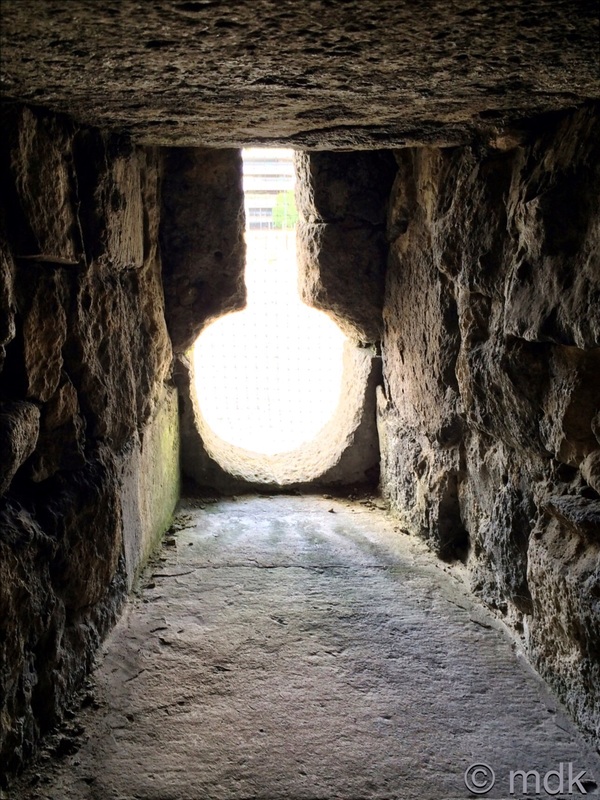 Imagine being shut in that cramped, dark room for hours at a time, the only light coming from the small gunports. The noise of the cannon must have been deafening and the heat and choking smoke unbearable. It may not have been a vault but it certainly solved a mystery for me. Outside again we climbed the steps to the top of the tower. This was the last part of the medieval walls to be used to defend the city. An anti-aircraft machine gun was mounted there in World War II. The mountings are still visible today. Apparently, just one plane was shot down from the tower, it flew on in flames and crash landed somewhere in the New Forest. Passing the top of the forty steps we looked down at the progress of the building work for WestQuay phase II. The top end of Western Esplanade has been closed off so we walked along the battlements to our next objective, the Castle Vaults. Anticipation built as Diana got the keys from her bag, unlocked the padlock and went inside to turn on the lights. This was what I’d been waiting for. 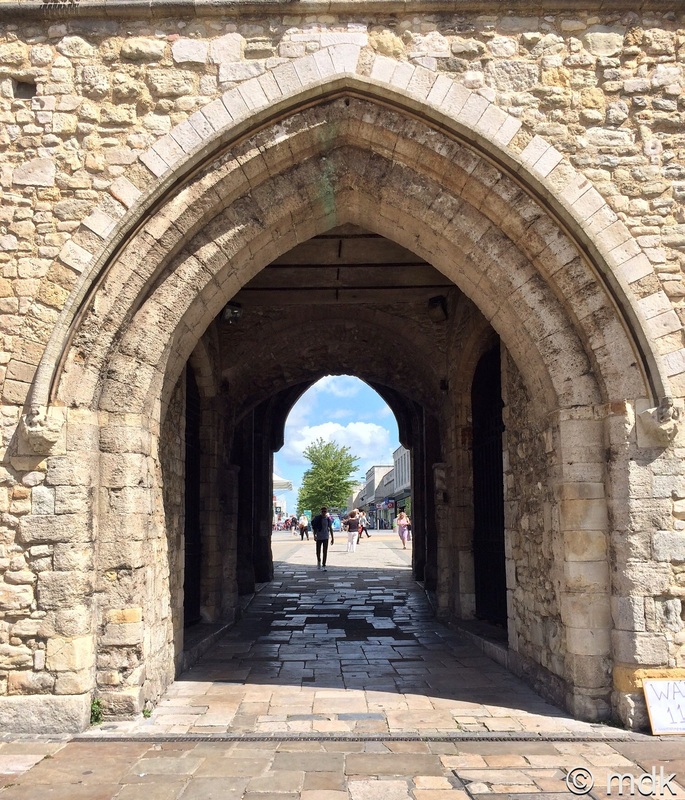 Southampton has more vaults than anywhere else in Britain, possibly because, in medieval times, the port was the main wine importer in the country. 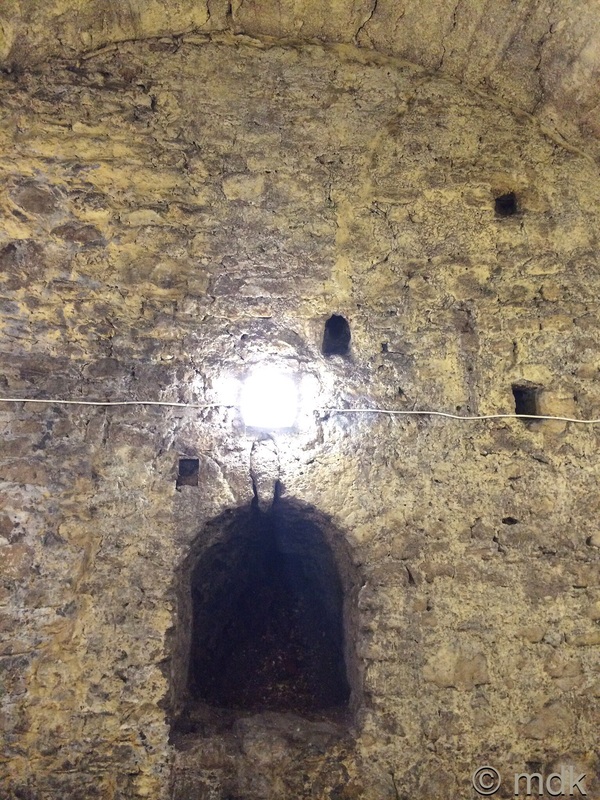 The castle vaults were built in the late 1100’s, when the King’s Prise tax on wine came into force. One in every ten barrels that came through the port had to be given to the king and this was where he stored it. 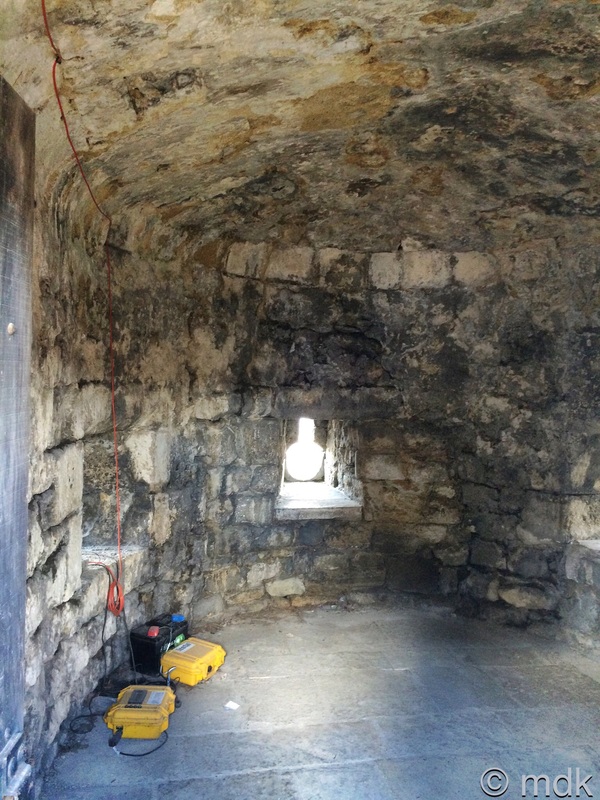 It was taken directly from the ships moored outside the door on Castle Quay, through Castle Watergate and to these vaults. 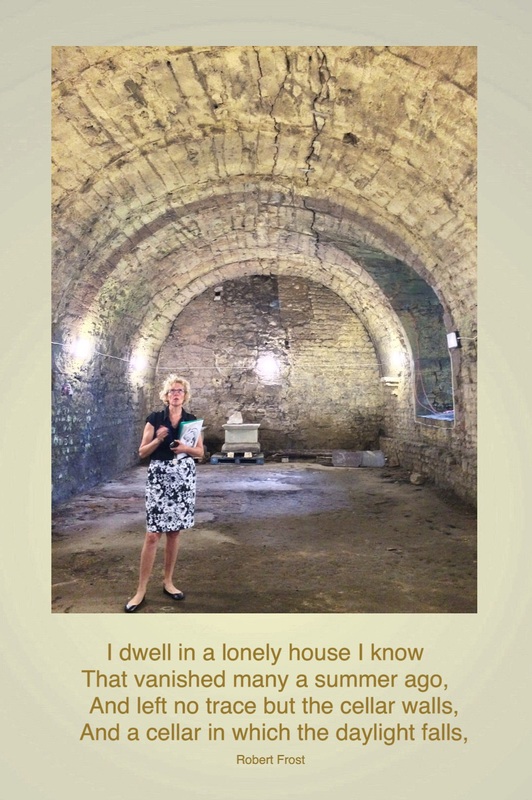 The vault was cold and larger than I’d expected with an arched ceiling and a rough, uneven floor. At the far end there were some pieces of stonework and other random objects. Apparently the council tend to use the vaults to store such odds and ends from time to time and Diana had no idea what they were. The walls were rough and, in places, greened with damp. A large crack zigzaged across the length of the ceiling, devices had been placed at intervals along it that would snap if there was any movement so we felt relatively safe. 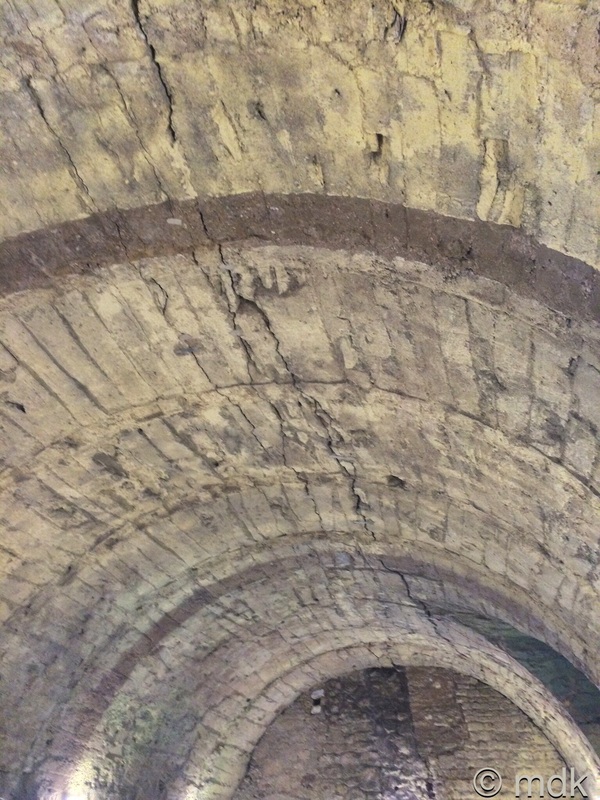 The ceiling of the vault on the other side of Castle Watergate has long ago crumbled, leaving just the ribs that once supported it. We’d looked down on them on our way along the battlements. 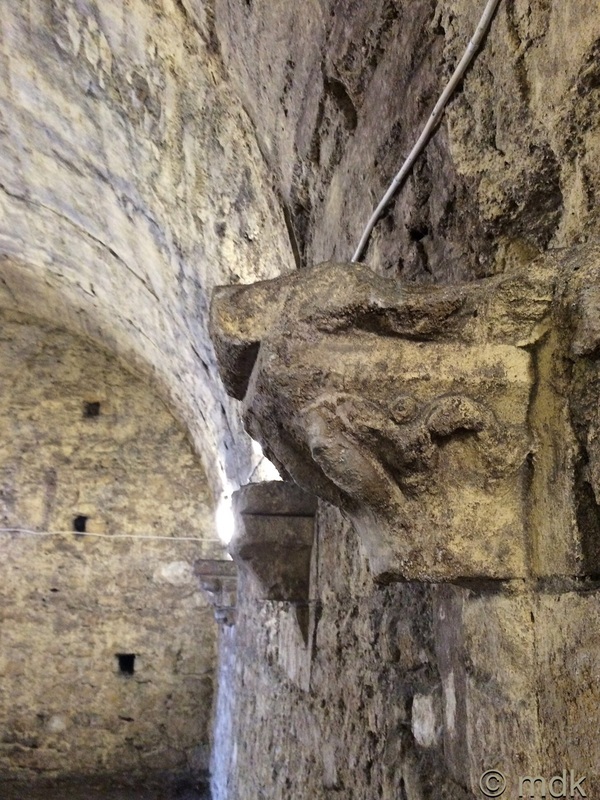 In contrast the supporting ribs in this vault are long gone, although some of the corbels that supported them remain. This may explain the crack in the ceiling. At intervals there were darker coloured stripes in the stone but these were not from the missing ribs, they were shadows of the blast walls put in place During World War II, when the vault was used as an air raid shelter. The vault is fifty five feet long, twenty feet wide and twenty five feet high. There is one small window to give light. 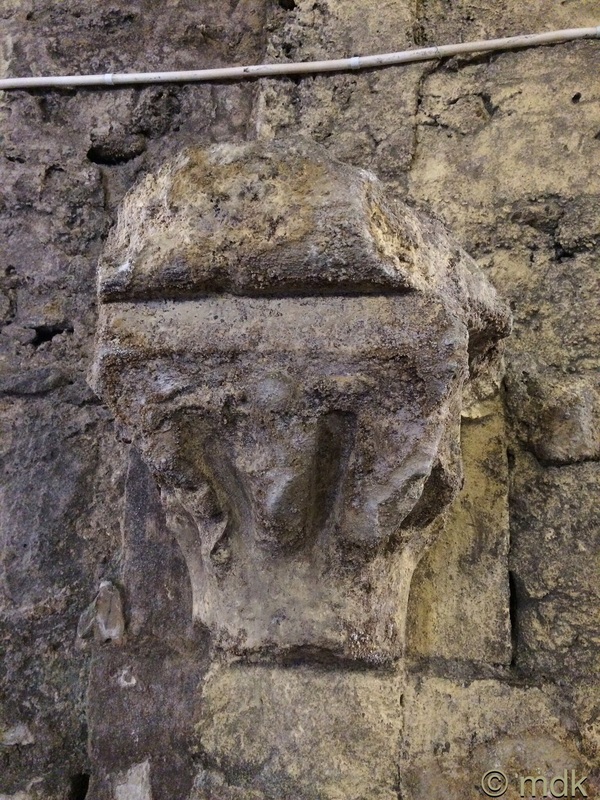 The wine would have been brought in through a door in the end wall nearest this window but this has since been blocked up, leaving just a change in the texture of the stone to show it was there. 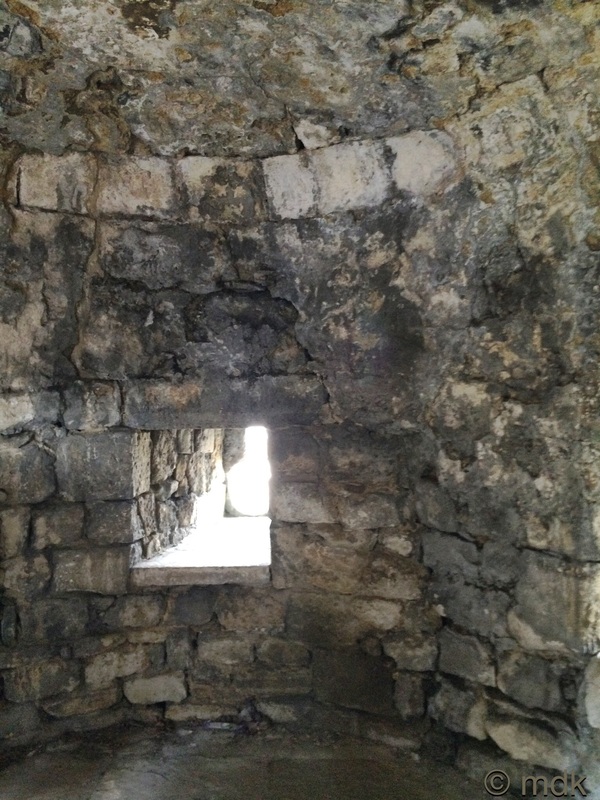 At the opposite end is a small arched opening in the wall, too small to be a door. Perhaps it held a candle because, without electric light, this must have been a cold, dark unwelcoming place. It was a shock to see the bright sun on Western Esplanade as we went back through the door. 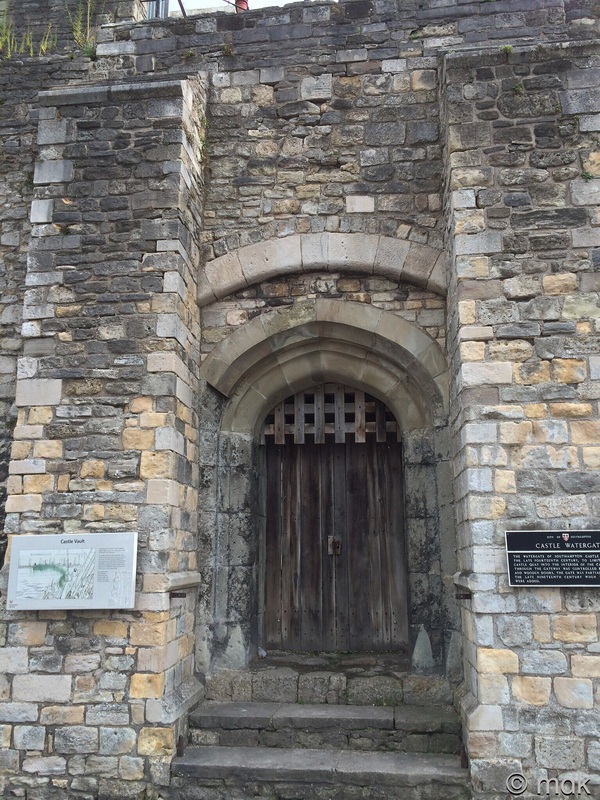 Following Diana, we passed the Castle Watergate where the wine would have been unloaded and the low window to the second vault that I’d once believed was a dungeon. When we reached the garderobe and the arcades we turned up Simnel Street where the town bakers once lived. Once Simnel Street was a prosperous area with large timber framed Elizabethan houses similar to Tudor House or the Medieval Mechant’s. The streets were narrow and dark though, in once place just five feet eight inches wide. Slowly family homes were turned into lodging houses, things became more and more overcrowded and the houses began to fall into disrepair. In one place the only thing holding up the timber framed buildings were the wooden beams placed across the street at head height. Looking towards the mast like top of the Quays swimming pool past pleasant modern houses it’s hard to believe that, by the ninteenth century, this was one of the poorest, most dilapidated streets in the city, crime ridden and prone to violent, drunken fights. Things came to a a head in 1894 when Ellen Wren, a washerwoman come prostitute of around fifty, passed out after one of her frequent gin binges and choked to death on her own vomit. Poor Ellen died in a filthy one room attic in Simnel Street. Such was the state of the place and the area in general, that the stench of her decomposing body wasn’t noticed until her landlord visited, angry the rent had not been paid. When the more affluent townspeople found out, the shock and outcry finally galvanised the council to clear the slums. 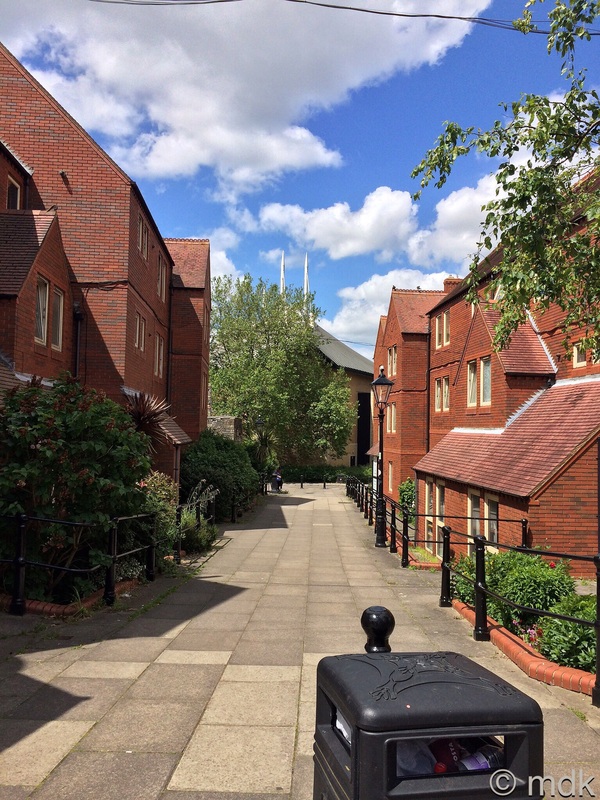 The first two council houses were built in Simnel Street in 1902, replacing a large timber framed building that had once stood above a shop. 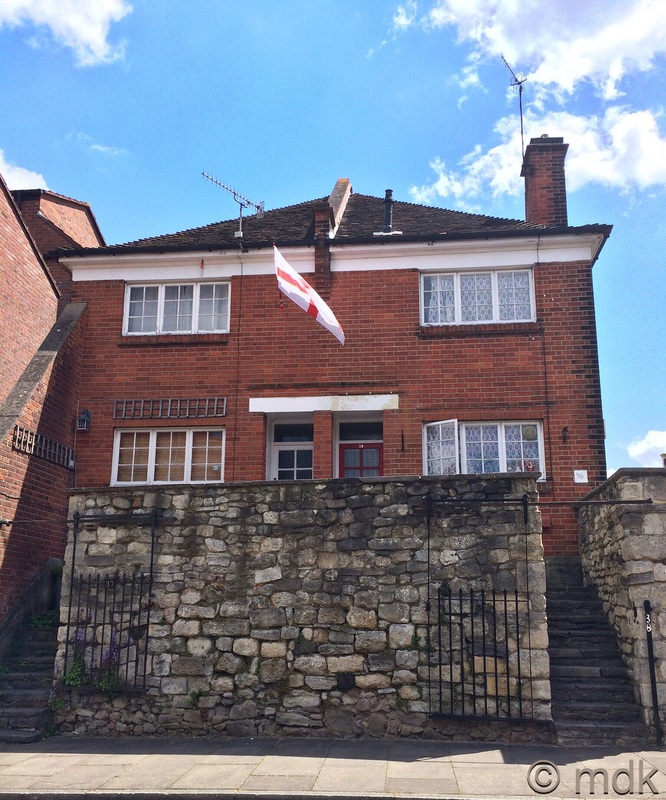 The fairly unremarkable red brick houses sit at the top of stone steps above a section of ancient wall. 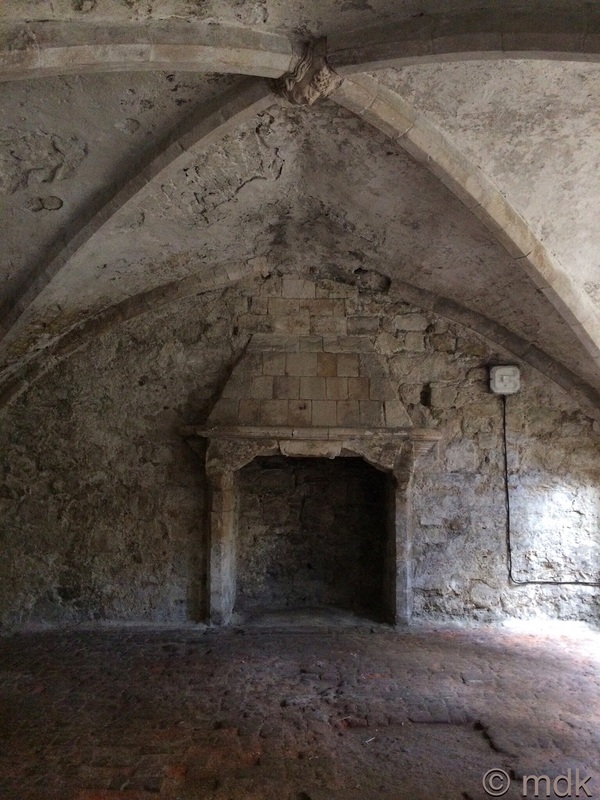 Beneath them hides the most beautiful of all Southampton’s vaults, The Undercroft. 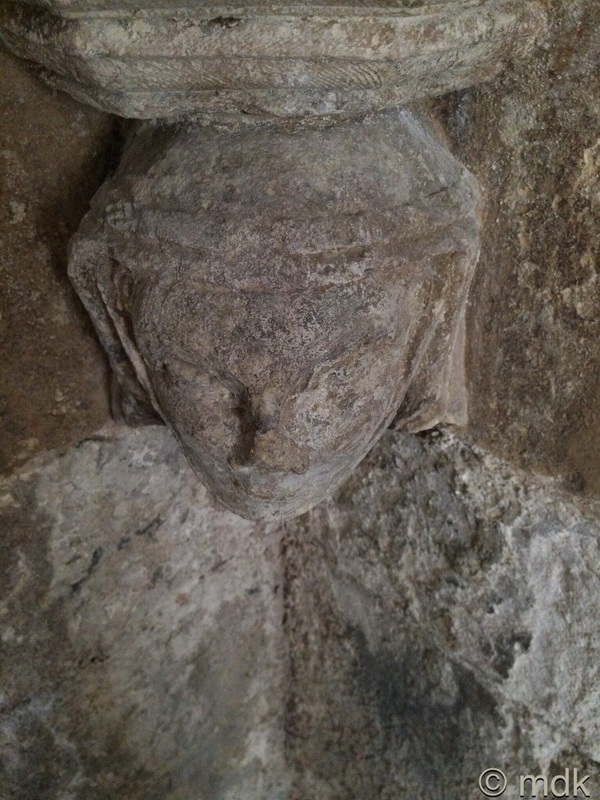 This early fourteenth century vault, thought to have been built by a stone mason from Beaulieu Abbey, is truly the creme de la creme of cellars, reminiscent of the fine wine cellars of Bordeaux. Many times I’ve stood on the street looking through the railings at the narrow passageway, strong wooden door and interesting windows and wished I could go inside. Now Diana was unlocking the gate. 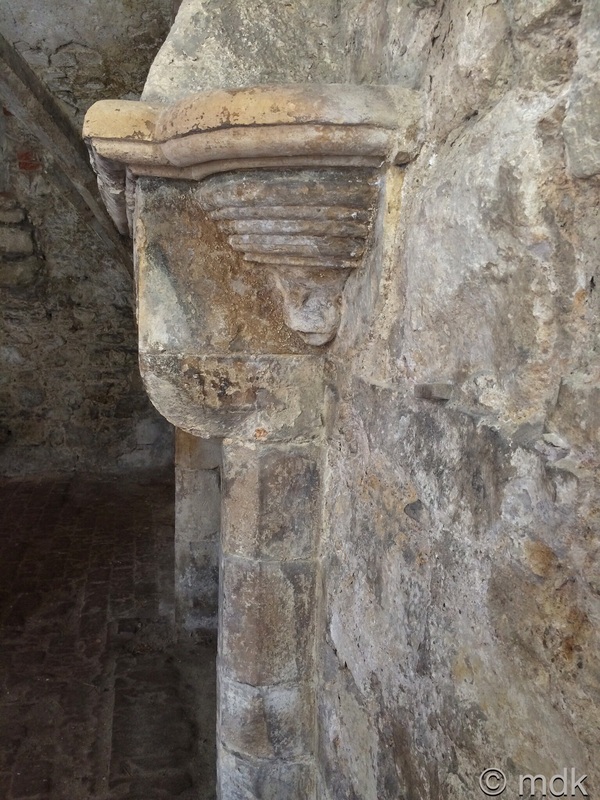 Once we’d descended the worn stone steps and entered there wasn’t the slightest hint of disappointment. The vaulted ceiling and two intersecting quadripartite ribs with elaborate central bosses were worth the price of the tour alone. This was originally a shop and the merchant spared no expense to keep his patrons happy. 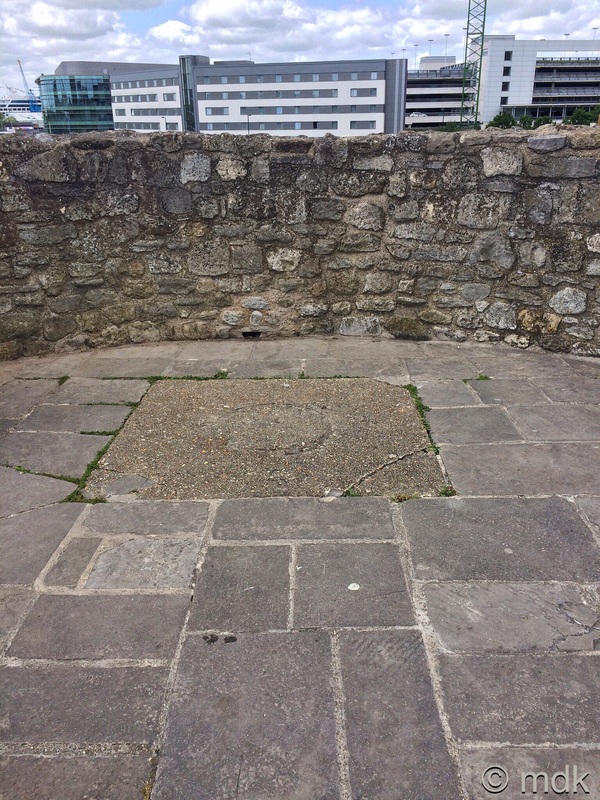 At the far end a large fireplace probably contained a charcoal brazier to warm customers in winter. 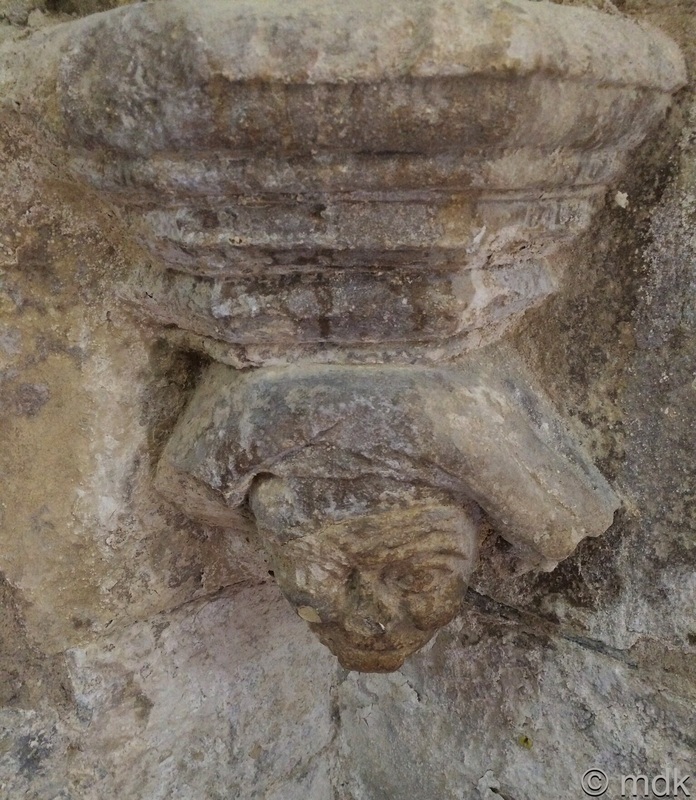 Carved heads adorn each corner, possibly the merchant’s family, or maybe the princes and princesses of the time. 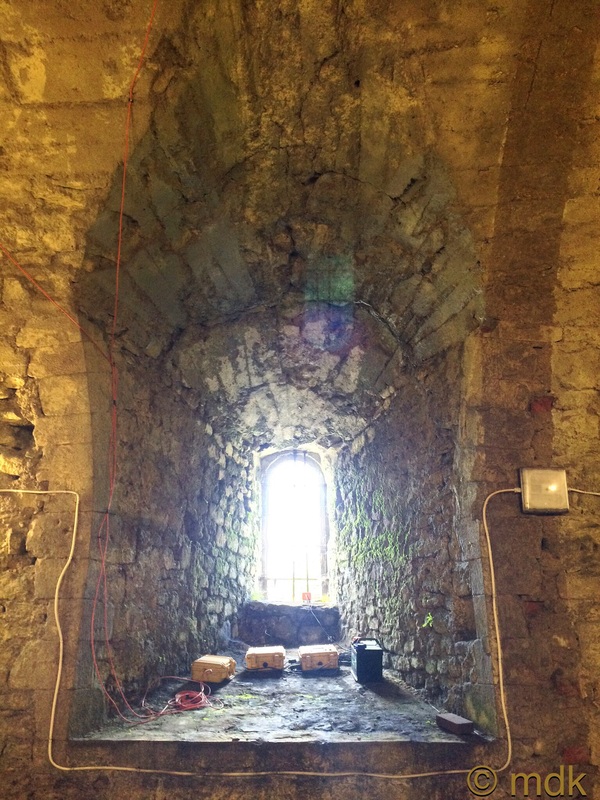 Diana pointed out the fifteenth century brick floor but, for me, the real show stealer was the double lighted window. 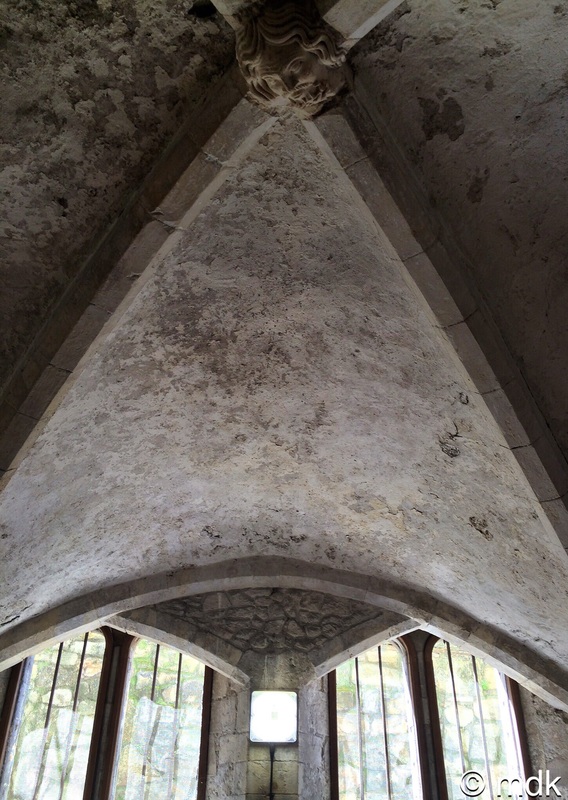 From the Christlike boss in the centre of the ceiling the ribs arch down to meet another arch framing the windows. 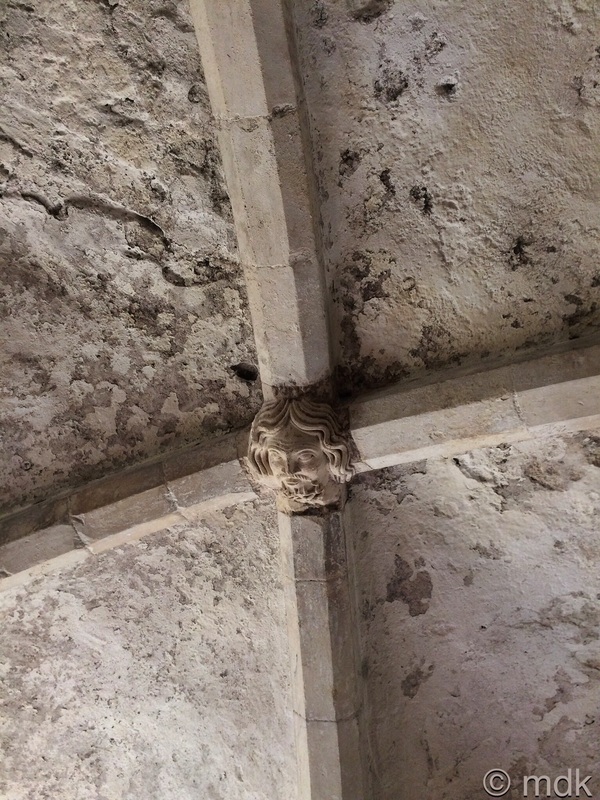 Two struts span from this to the centre of the windows forming a gothic arch over each. Something about the way the light came through those old windows, the shadows it created and the glimpse of old stone outside made me want to paint it. CJ crouched in the corner opposite the window. Above him a ragged arch in the wall revealed red brick. 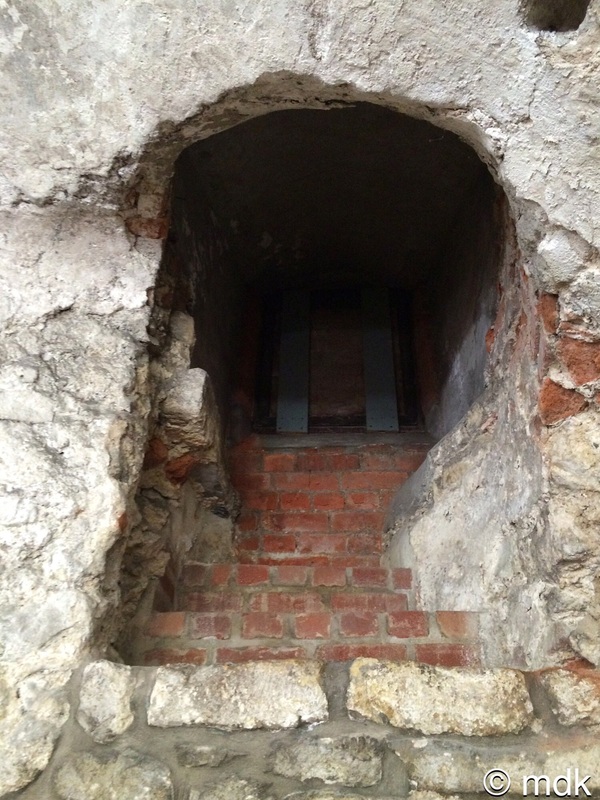 This was the emergency exit from the vault when it was used as an air raid shelter. Unsurprisingly, this was the most popular shelter in town, not least because the Donnarumma Trio, musicians from a local night club, would bring their instruments with them and serenade the sheltering townsfolk. If you had to spend the night cooped up underground while the bombs fell this was certainly the place to do it. Much as I’d have liked to carry on and see the other city vaults, this was the last on the list for our tour. 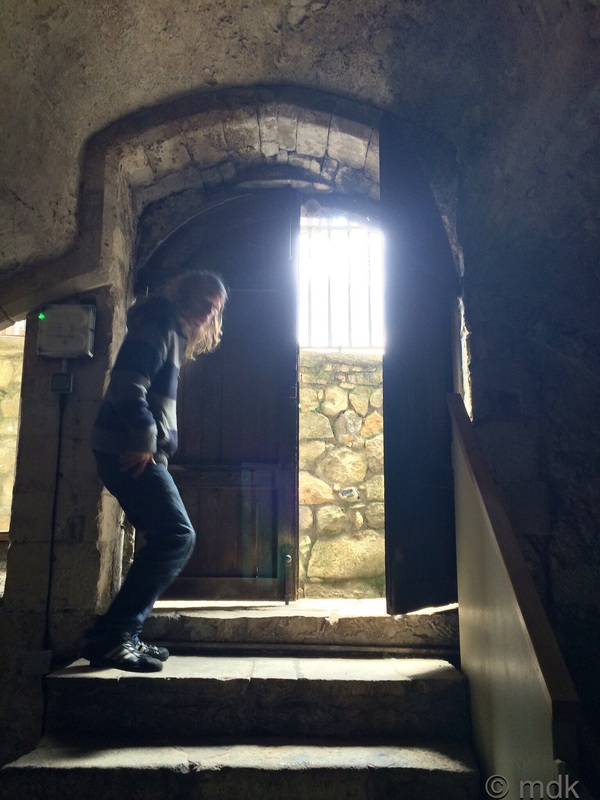 Reluctantly we climbed the steps again and walked into the light, knowing a little more of the secrets hidden beneath Southampton’s streets. I lived in Woolston from ’43 til’73 and never knew these existed. Thank you for sharing. I think I must pay a long overdue visit to Southampton (Swampton). Well worth a visit Dave. 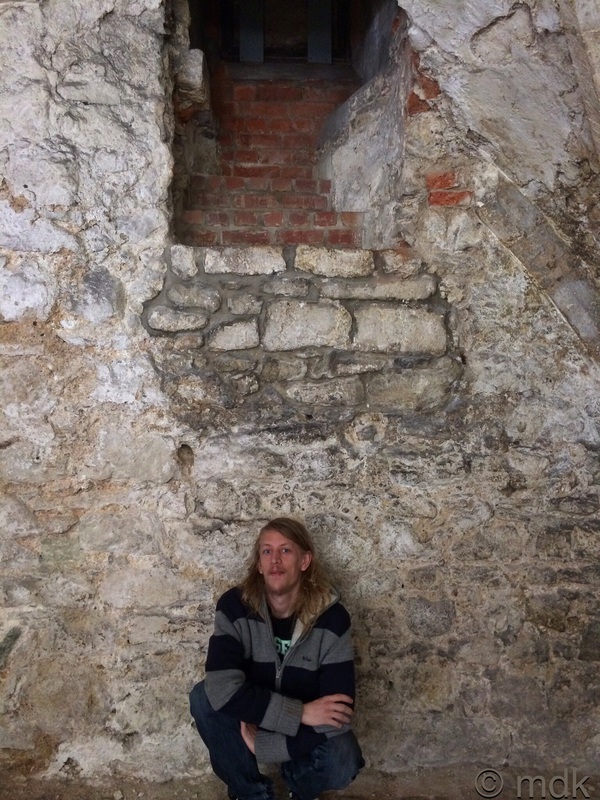 I believe there are vaults in The Medieval Merchants house too. I may have to add it to my list. Thank you for sharing this. Fascinating to see exactly what is behind those locked doors we walk past. The photo of the windows (6th from the end), there is something about the shape which reminds me of Darth Vader! I’ve been looking at the locked door for ages myself wondering. Now I know. 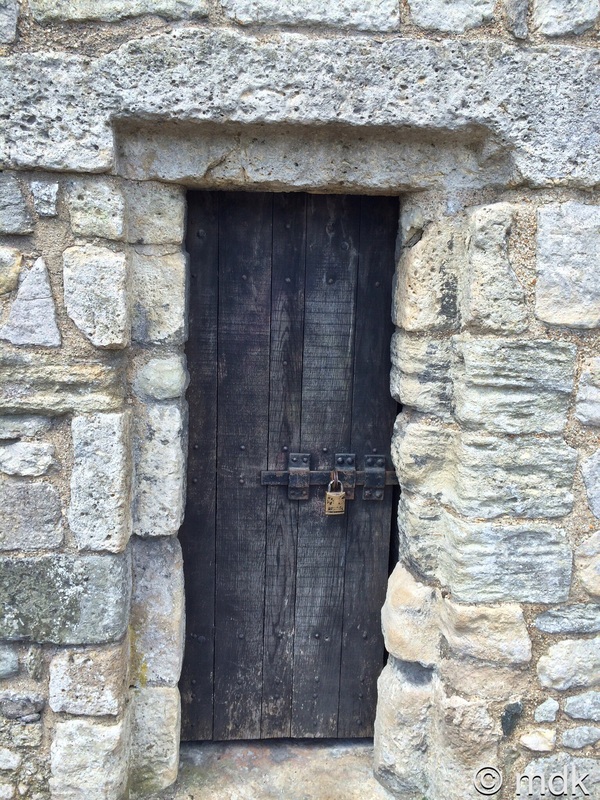 What a splendid tour and how wonderful to have the mystery of the locked door explained at last, you must have been thrilled. You didn’t say how it affected your toe but not too badly I hope. How fascinating! I wonder what the King did with all those barrels of wine that he took from the importers? 🙂 Great photos. Im guessing he made a tidy profit on them Ruth. Either that or he had a terrible drink problem. Now I have to work out how to get into the other vaults. It sounds like the king sure did like his wine! That tour was worth the price, whatever it cost. Just think how many people have probably never seen any of it. I hope the toe is better now. My daughter broke her little toe once too. The tour cost less than a couple of cups of coffee each so well worth it. My toe is ok, still aches but I can live with it. Excellent, a really interesting read, with wonderful photos ! Can’t wait to visit Southampton agian ! Thank you Alison. I hope you get a chance to visit soon. 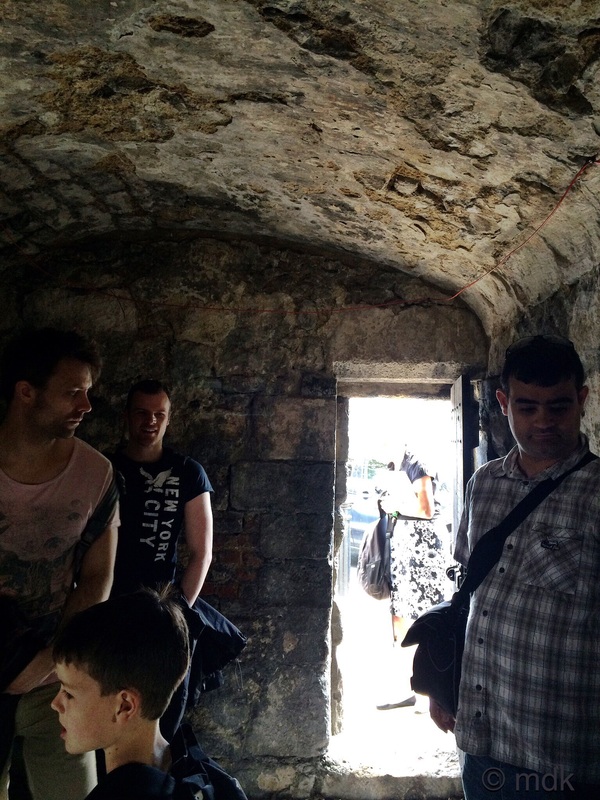 The castle vault was my favourite in an interesting tour. Thank you. It really was an interesting walk. Now I have to find the other vaults and find out how to get in them. Dear Marie, Many thanks for an interesting, and very well written, report. I was born and raised in Southampton many moons ago, but ashamed to say that although aware of these vaults etc never got round to visiting. Now living in Lincolnshire but get back to my home town whenever possible to just wander the streets, remembering past times. I’m finding it difficult to coincide my visits with the tours. Congratulations on the photography – splendid photos. I can relate to your desire to get the paints out – I felt the same especially on the very last picture looking up at the open door and at the very deep shadows cast, especially those on the steps. This scene just begs to be captured. I’m pleased to bring back some happy memories Eric. At least you got to see the vaults second hand. It’s been a long time since I did any painting but it did make my fingers itch. I guess I’ve swapped the paint brush for the camera these days. Kicking a Hoover is never a good plan. I did it by accident and that didn’t turn out so well either. You took my breath away with this one! I had no idea you have such an appreciation and understanding of architecture!? I was lost in the history and learned without knowing it. Thank you! Another post that I have to refrain from reading to! Will come back to it after attending vaults tour next Sunday. 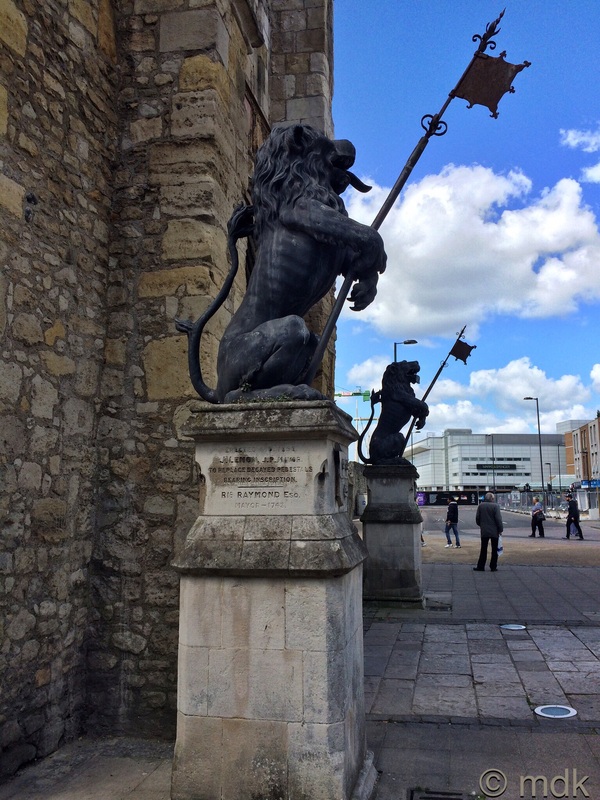 Your blog is an inspiration: since I discovered it I walk through Southampton with my eyes wide open. Now I could read your post: just done vaults tour. The Undercroft is beautiful, I will have to go back there to take some decent pictures (yours are excellent), as group of people was preparing to record music in there, our guide tour was as surprised as were we. 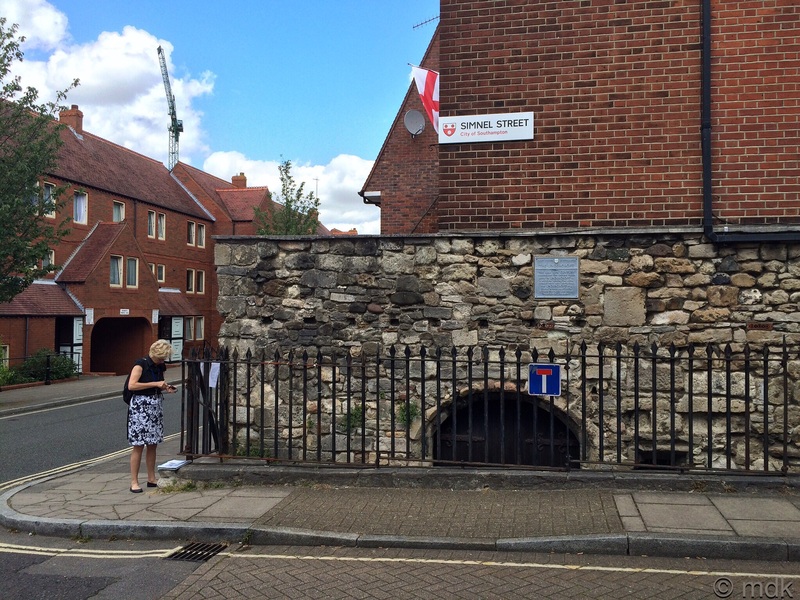 We had some spare time to visit 94 High Street vault- very tragic story of all those who drowned there. 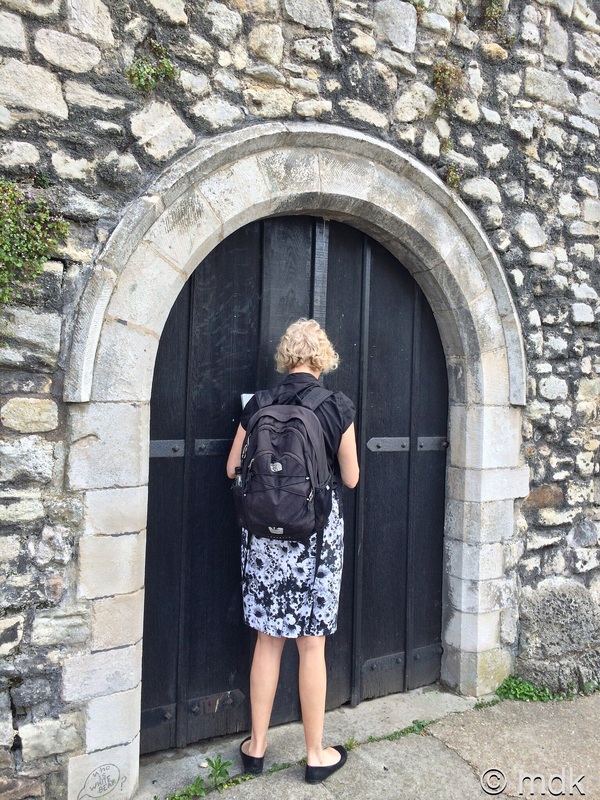 I wonder how to get to other vaults… According to internet research there’s 48 vaults in Southampton… I think that ‘Music In The City’ festival will be good opportunity to see few of them, although they will be a bit crowded for sure. 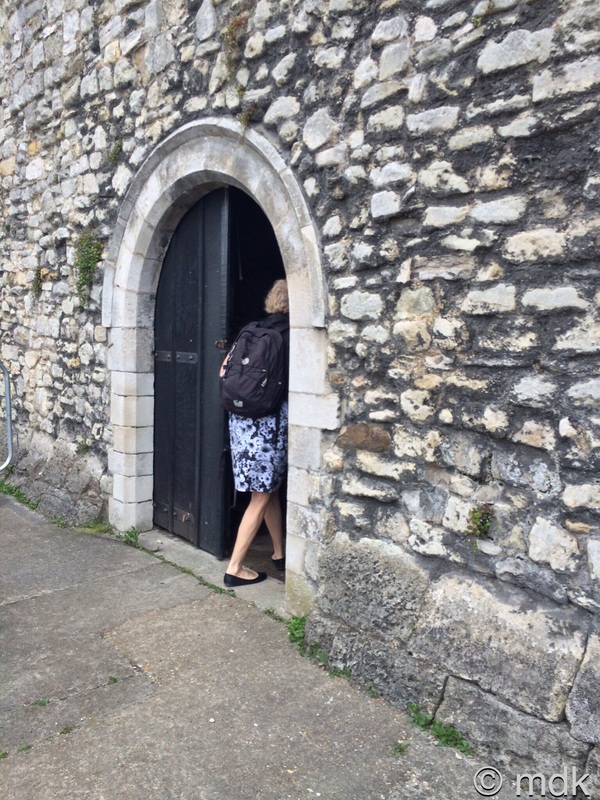 But also there is Vaults Tour organised by Tudor House: have to enquire about it. That sounds interesting. I e’d wondered how many of the other vaults are accessible too. There is a small vault in Tudor House you can go into. 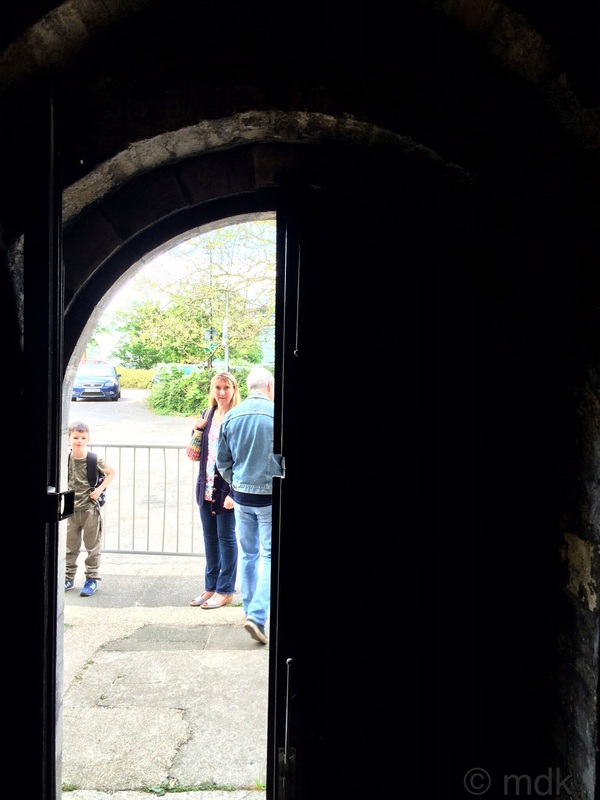 It was once used as an air raid shelter. I’ve been to vault in Tudor House vault, but thanks for sharing your knowledge anyway. I just wanted to let you know that this Saturday, 12th of March, there will be “Invisible Movement” Festival. 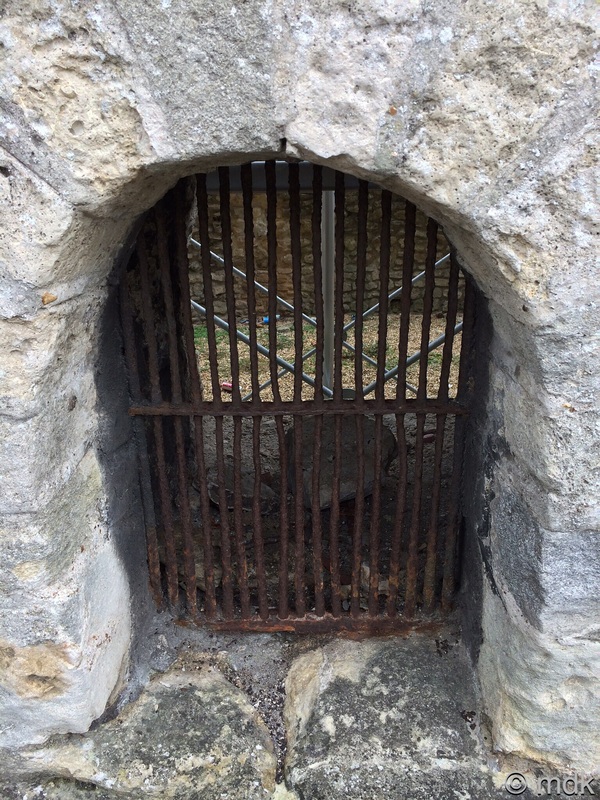 It will start at 11 am, and public will get acces to Lankester Vault (or Lancaster Vault), the one on High Street, just opposite Dolphin Hotel, and to The Weigh House Vault- you’ve mentioned this one in your post about French Street. Entry is free of charge. Next Next post: Coffee in a medieval garden and an air raid!